Adam Lambert and Siobhan Magnus are soul mates. 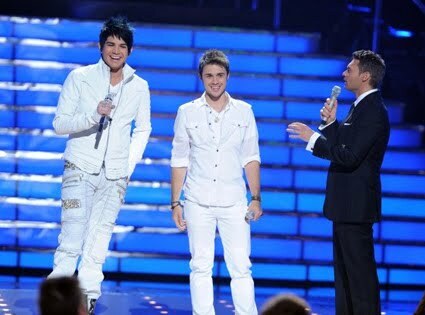 They both represent the edgier talent on 'American Idol' and Adam's fame even though he did not win last year has far surpassed Kris Allen (pictured with him above) who defeated him. That is why Lambert, not Allen is back on Idol next week, tutoring the final nine contestants -- and why he and Irish American Siobhan have so much in common. The Boston Globe called Siobhan downright 'kooky' after her recent performances and much of the same kind of language was used about Lambert last year. With his eyeliner and gay persona, Lambert grabbed the fans in a way that no other contestants did. Siobhan with her freaky tattoo about a cartoon character who killed children has certainly matched that,as well as her outrageous choice of outfits, her career as a glassblower and all round eccentric ways. But there is no mistaking Lambert's or Siobhan's talents which is why they grabbed our attention in the first place.